iStock; Olivier Douliery-Pool/Getty Images; Samantha Lee/Business InsiderDonald Trump’s comments are hurting the dollar. The US dollar is falling on Tuesday morning. The slide comes after Trump said he was “not thrilled” with the Fed raising interest rates. You can follow live currency movements on Markets Insider. 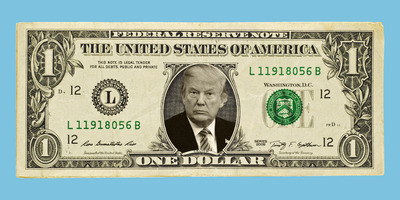 LONDON – The dollar is falling against the pound and euro on Tuesday morning after US President Donald Trump publicly criticised the Federal Reserve for raising interest rates. Trump said in an interview with Reuters on Monday that he was “not thrilled” by Fed chairman Jerome Powell’s decision to raise interest rates and would continue to criticise the Fed if interest rate hikes continued. It followed reports earlier in the day that Trump had criticised Powell at a private GOP fundraiser. Trump has attacked the Fed for raising rates in the past. The latest remarks have hurt the dollar as investors’ expectations of future rate hikes have now been dampened. The greenback is down 0.3% against the euro to 0.8678 at the time of writing (8.30 a.m. BST/3.30 a.m. ET), while the dollar is down 0.31% against the pound to 0.7790. The US dollar index, which measures the greenback against a basket of six major currencies, is down 0.19% to 95.55. Neil Wilson, the chief market analyst at Capital.com, said in an email on Tuesday morning: “Trump’s not thrilled with the Fed raising rates. At the same time, he accused China and the EU of currency manipulation. Taken together with previous comments, we see a clear pattern of the president willing to talk the USD lower whenever it starts to look a bit toppy.